A premiere meet in the state of Illinois was held at Belleville West High School. 32 teams were present for the highly dubbed top shelf invitational, which had a number of highly ranked athletes competing. Charlie Wetzel (Jr) of Normal West started things off in the 3200-meter run. What seemed like a solo effort for the first mile, soon became a battle for the top spot when Edwardsville senior Max Hartmann decided to make a move right at that mark. Hartmann took the lead for the next two laps, but the lead was then taken back by Wetzel with a lap to go. Wetzel widened his lead to win in a 9:38, and Hartmann second in 9:44. Hartmann was followed closely by Casmir Cozzi (Sr) of Mascoutah who made up quite a bit of ground in the final 400 meters. Cozzi closed in a 64 for a finishing time of 9:45. Robert Williams (Sr) of Springfield had a busy day, placing first in both the 110M and 300M hurdles, and then anchoring their 4x400 meter relay. Williams ran a 14.50 (+3.0) in the 110 hurdles and 38.69 in the 300 hurdles. 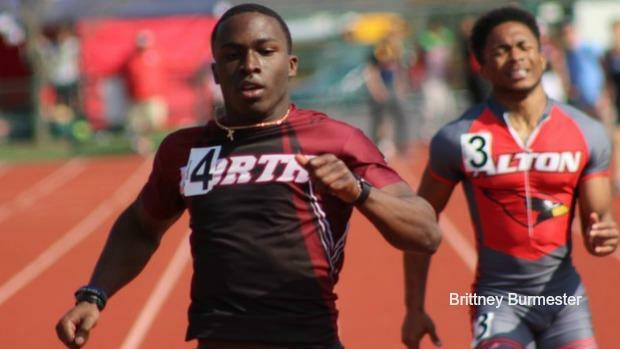 All eyes were on superstar Marcellus Moore (Jr) of Plainfield North each time he stepped onto the track. The spectators rose from their seats and the athletes lined the inside of the track to watch the nationally-ranked sprinter. His first race of the day was to anchor the 4x100 meter relay. It looked like Plainfield North was in the fifth position going into the final exchange, but once Moore received the baton in a rather slow exchange, he ran down about three meters and flew past the entire field to capture the win for Plainfield North in 42.69. Canyon Bownes, Kyle Burke, and Anthony Capezio made up the rest of the relay. Mascoutah ran a time of 43.13 from the third heat of four to place second. Moore later ran the 100-meter dash in a 10.36 (+1.5) and the 200 in 20.89 (+2.8); both in meet-record fashion. Andrew O'Keefe (Sr) of Granite City took things out from the gun in the 800-meter run. He won in 1:54.97 and was followed by Jason Hoffman (Jr) of Minooka in 1:57. Hoffman and Minooka teammate Jordan Freese (Sr) pushed each other throughout the race, but Cassius Havis (Jr) of Alton separated the two to capture third place in 1:59. The 400-meter dash was led by Elijah Patrick (So) of South Elgin in 50.68, and the 1600 meter run was won by Roland Prenzler (Sr) of Edwardsville. Prenzler and teammate Jack Pifer took turns leading the race. Pifer helped set the pace for the majority of the race, only to be outkicked by his teammate in the final lap. Prenzler ran a time of 4:27 and Pifer 4:28.27. Michael Varzino (Sr) of Metea Valley almost surpassed Pifer in the final straightaway but finished in a time of 4:28.29. Zack Pluff (Sr) of Freeburg won the high jump with a mark of 6'5. Jadon Elliott (Sr) of Triad had an excellent day in the pole vault. His mark of 14'6 had a significant lead over second-place finisher Rick Undesser (Jr) of Minooka with 13'0. He was then followed by Allen Kraus (Jr) of Waterloo with a mark of 12'0. The long jump was won by Kenyon Johnson (Jr) of Edwardsville in 22'6, and Quinton Stringfellow (Sr) of Homewood-Flossmoor won the triple jump with a mark of 48'5. Barry Evans (So) of Mascoutah won the discus with a throw of 139'1, and Ahmoniel Barr (Jr) of Thornton won the shot put with a mark of 50'6.75. Barr just barely edged out Joe Edwards (Sr) of Lockport Township for the win, with Edwards throwing 50'5.25. It was a close battle for first place in the team standings, with each race being equally important. Edwardsville edged out Homewood-Flossmoor by three points to win with a point total of 61. The win was likely aided by the Freshman/Sophomore 4x400 as the meet wound down. The Edwardsville Tigers took sixth place in that race to earn them three points. Their varsity race then placed fourth out of only the second heat of four. Homewood-Flossmoor took second in that event from the fourth heat, but that did not give them enough leverage to surpass Edwardsville. Homewood-Flossmoor had a total of 58 points and were followed by Minooka with 53 points for third place. Plainfield North was fourth, and Lockport Township fifth.